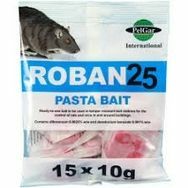 Roban Rat Poison Pasta Bait 15 x 10g baits is a ready to use rat and mouse poison bait suitable for use indoors and around buildings. Roban Rat Poison Pasta Bait 15 x 10g bait sachets is a ready to use rat and mouse poison bait suitable for use indoors and around buildings. * Peanut flavoured attractant for quick acceptance. Low Level of Rat Activity - 6 to 10 sachets every 10 metres where evidence of rats is found. High Level of Rat Activity - 6 to 10 sachets every 5 metres where evidence of rats is found. Can be used in our Tamper Resistant Rat Bait Boxes.